With the Republican and Democratic presidential nominees’ favorability ratings at unprecedented lows, many voters will likely emerge from their polling stations embarrassed to admit that they voted for Trump, or for Clinton. News reports also suggest that the polls are skewed because those contacted by pollsters do not want to admit they prefer one or the other. Certainly you have no obligation to reveal your vote to family, friends, or pollsters, but may a court ever compel you to reveal your ballot selection? The answer is no—the political-vote privilege, recognized by most states, protects your vote from compelled disclosure, except in limited situations. The Proposed Federal Rules of Evidence 507 contained a political-vote privilege which provided that “[e]very person has a privilege to refuse to disclose the tenor of his vote at a political election conducted by secret ballot unless the vote was cast illegally.” Congress rejected this and other enumerated privileges, leaving privilege development to the evolution of common law. Since then, only a few courts have recognized a political-vote privilege. See, e.g., In re Dinnan, 661 F.2d 426, 431–32 (5th Cir. 1981); D’Aurizio v. Borough of Palisades Park, 899 F. Supp. 1352 (D.N.J. 1995). No court has rejected the privilege. The majority of states recognize a political-vote privilege. Some follow either the Model Code of Evidence or the Uniform Rules of Evidence and include a political-vote privilege in their rules of evidence. Other states follow the federal model and leave the issue to common-law development, and most of these states have adopted the privilege. 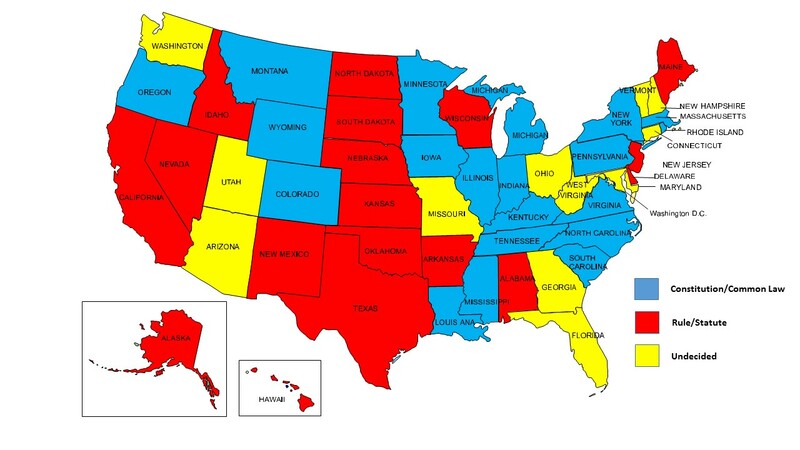 The map above shows where all states stand. The only exception to the privilege arises where there is a finding that a person cast his or her vote illegally. Otherwise, the political-vote privilege should shield a court from compelling you to identify whether you voted for Clinton, Trump, or anyone else. Outside the courtroom, the privilege also serves as a handy answer when quizzed about your ballot selection at cocktails parties and Thanksgiving gatherings. It’s your privilege—use it as you wish.